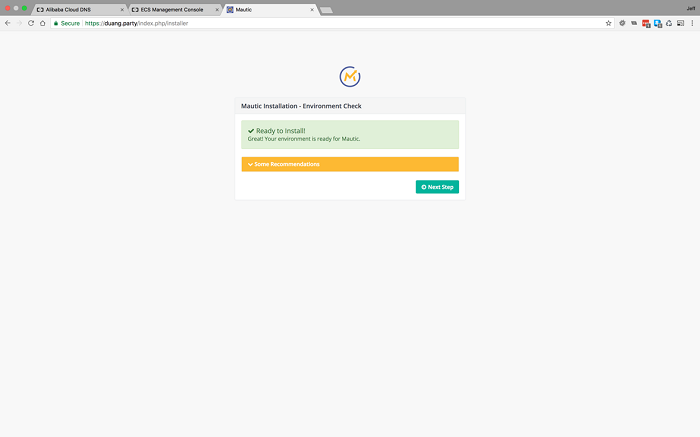 In this tutorial we will install Mautic on a LEMP stack, using the Webinoly optimized server automation tool. Mautic is the world's largest Open Source marketing automation project, with over 1000 contributors to the project. It is available in 35 languages and used by over 200,000 organizations. Effective marketing campaigns use a network of multiple channels and involve a lot of repetitive tasks with interrelated complexities. Mautic, and other similar software, are powerful tools that make these complex and repetitive tasks easy. Marketing automation software tracks every lead, or visitor to your website and other online locations, and analyzes visits to build a profile of visitors and automates actions based upon their activity. Integrations with popular Customer Relationship Management (CRM) software provide a constant stream of high quality leads ready to be converted into sales and clients. Marketing Automation is like a bridge between your leads and your customers. Mautic provides a mechanism to develop and target multi-channel marketing resources, from dynamic web content and landing pages, forms, automated email engagement and marketing, to web notifications, text messages, tweets, and social monitoring. 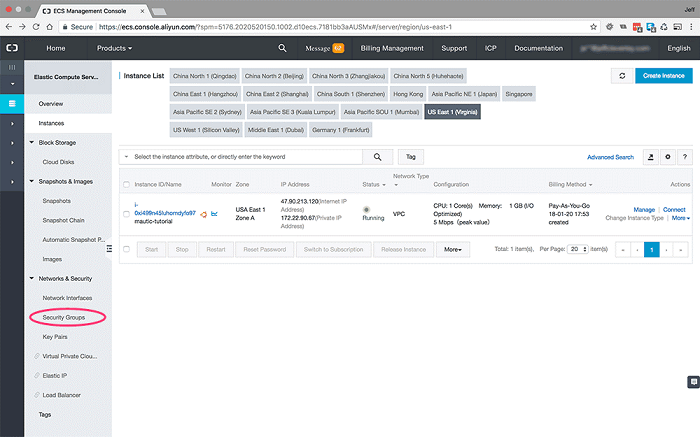 It has integrations with third party platforms including Salesforce CRM, Sugar CRM, Microsoft Dynamics CRM, Zoho CRM, FullContact, MailChimp, ConnectWise, and many more. Since it is open source, it is also completely customizable with a healthy developer community building all manner of other integrations. 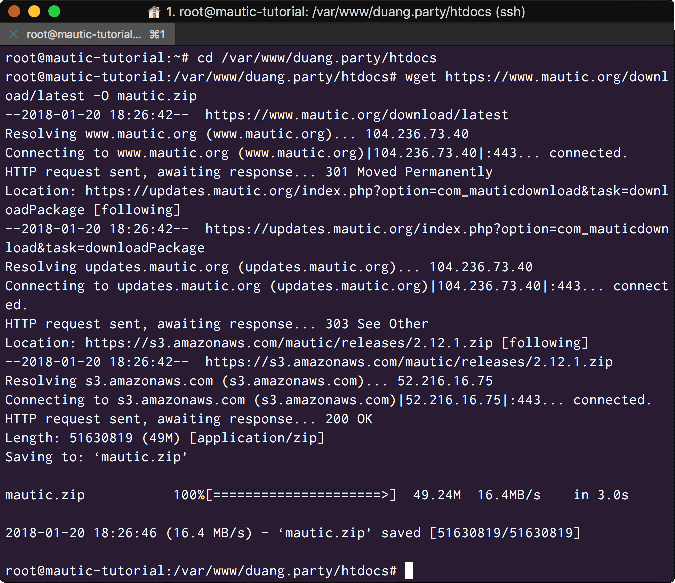 Mautic is built on Symfony, the highly popular and extremely performant PHP framework, and will run on either a LEMP or LAMP stack. 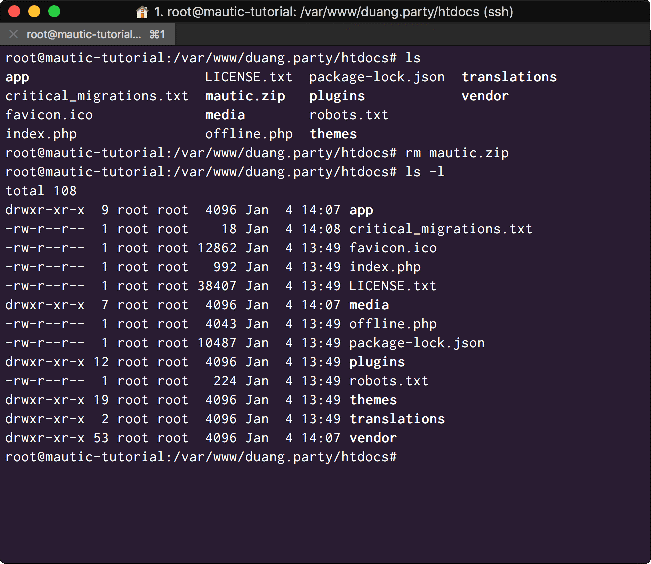 In today's tutorial we are going to install Mautic on a LEMP stack, using the Webinoly optimized server automation tool. 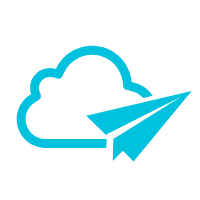 We will then set up an Alibaba Cloud DirectMail email account to use as the SMTP provider for Mautic emailing. 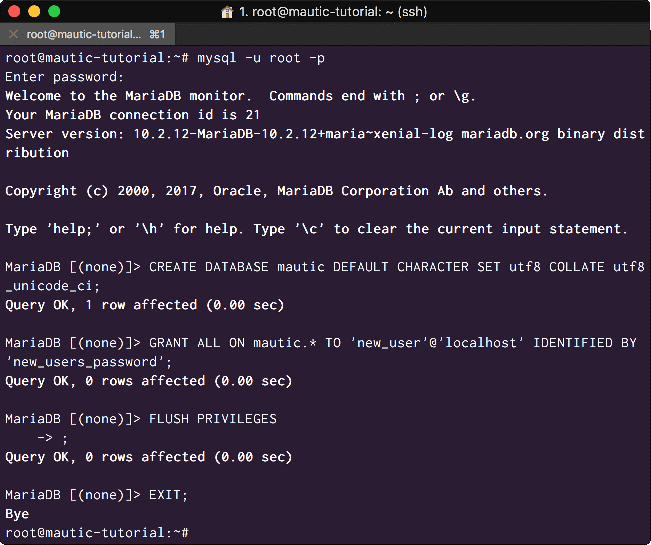 I will be using a root user to issue commands in the examples. If you are not using the root user, please remember to issue the sudo command before each command where root privileges are necessary. In the code and command examples I will be using 'example.com' as the domain. This will need to be replaced by your own domain when you follow along. In the images used to illustrate each step, I have used a free domain I had available 'duang.party', again remember in your commands use your own domain. 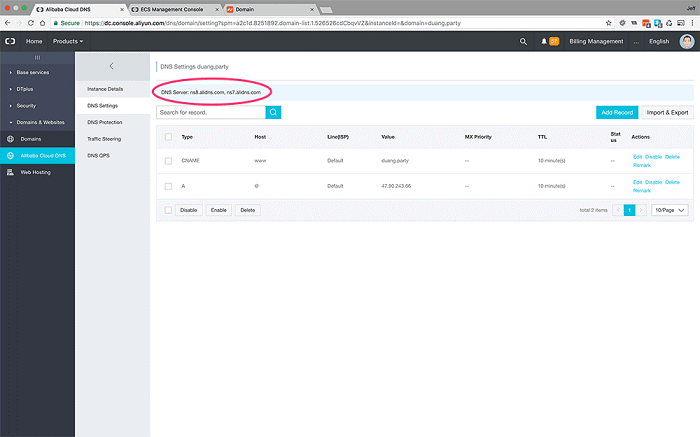 Before you begin this tutorial, you should have an Alibaba Cloud ECS instance provisioned and running, with at least 1GB of memory. You should have uploaded your public SSH key to the server during provisioning so that you can access your server by SSH in the terminal. If you haven't done this before, you can find instructions in this tutorial. You should also have a domain name available to use. You should now see your security group in the Security Group list. Locate the 'Configure Rules' option at the right of your security group row, and click it. You will now be taken to a page with two tabbed panels. 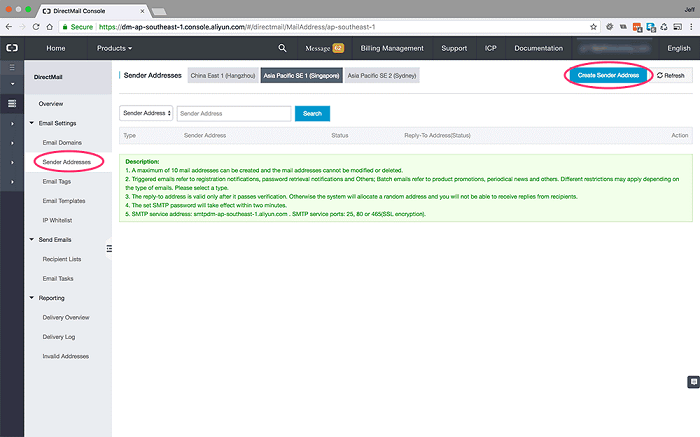 One tab will show you your Inbound Security Group Rules, the other will show you the Outbound rules. You will need to add at least two records. 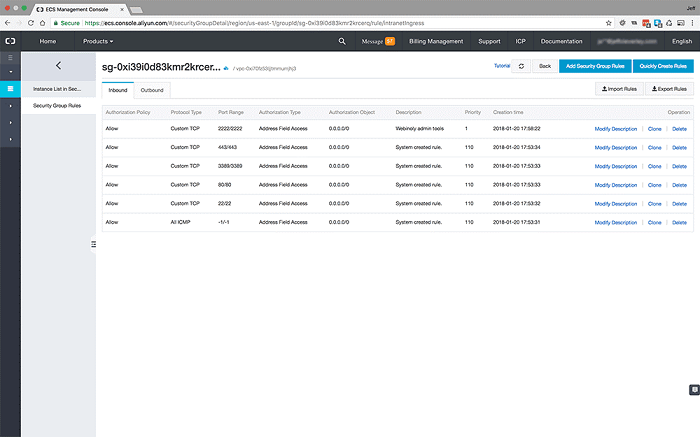 An 'A' record for '@' (all) host, with the value of your Instance public IP address. And a 'CNAME' record for 'www' host, with the value of your domain name. 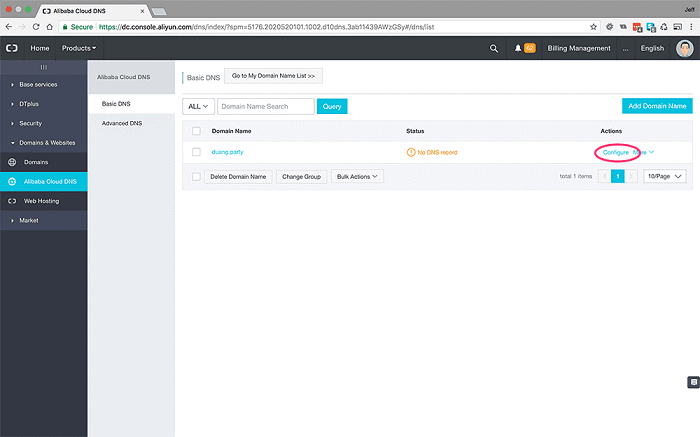 If you are using a domain with Alibaba Cloud Domains, then you should be finished here. 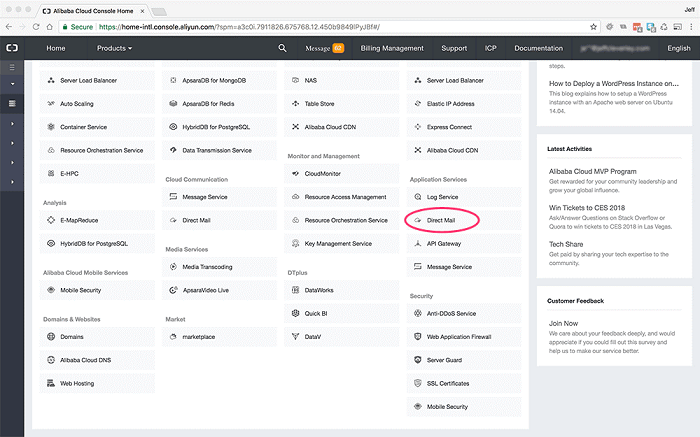 If you are using a domain registered with a third party domain registrar, you will need to log in to your account at your domain registrar and change your domain's nameservers (DNS servers) to point to the Alibaba Cloud nameservers. 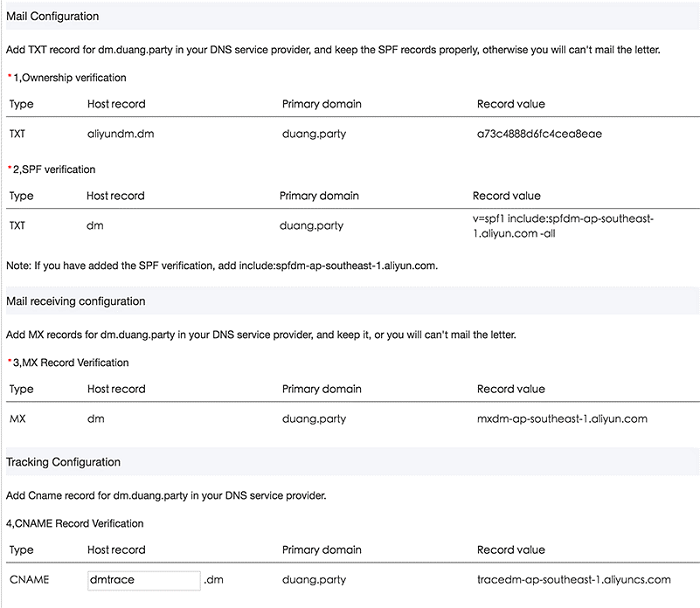 Now go back to Alibaba Cloud DNS, and enter each of these records and their values in your domains DNS records. 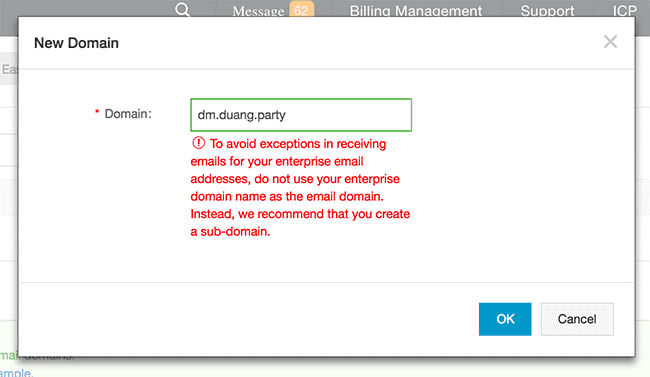 Choose your email domain from the dropdown menu. You will also need to set a Reply-To address. 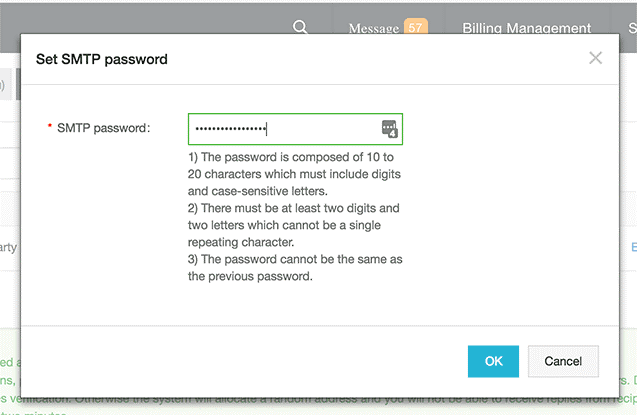 This is not the Reply-To address used by SMTP in Mautic, it is only used for communication with the Alibaba Cloud console, but it must be verified before you can progress and set up your SMTP password. Next chose your mail type. You can choose either 'Triggered Emails' or 'Batch Emails'. In real world usage of Mautic, you would set up both, Triggered Emails for transactional emails, and Batch Emails for Email newsletters and mass mail-outs. For the purposes of this tutorial I will choose 'Triggered Emails'. Direct Mail will immediately send an email to the Reply-To address you set. You will need to go to your email inbox and click a link before you can proceed further. You will also require the the Alibaba Cloud Server Addresses when you set up Mautic. These can be found here. Webinoly is an excellent tool that automates the installation of an optimized LEMP web server stack on any Ubuntu 16.04 Instance. It installs Nginx, MariaDB (MySql) and PHP7, alongside command line tools to automate the provisioning of Let's Encrypt SSL Certificates, FastCGI Static Caching, Redis and Memcached Object Caching servers, and logging tools to help manage your server stack. 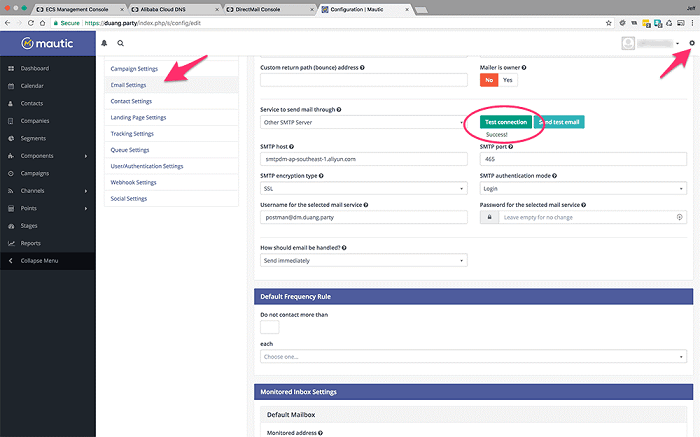 With Webinoly it is incredibly easy to configure your Nginx Virtual Host for your site. 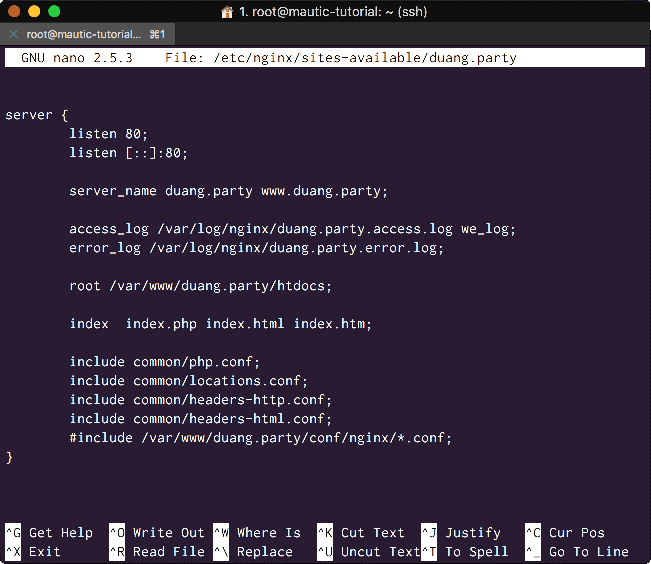 Webinoly has now created the directory structure and root directory for your site, and configured the Nginx virtual host configuration file necessary to run a PHP based site from it. Your Nginx Virtual host configuration file is located at '/etc/nginx/sites-available/' and has been automatically symlinked into '/etc/nginx/sites-enabled/'. Your site root directory has been created at '/var/www/htdocs/'. 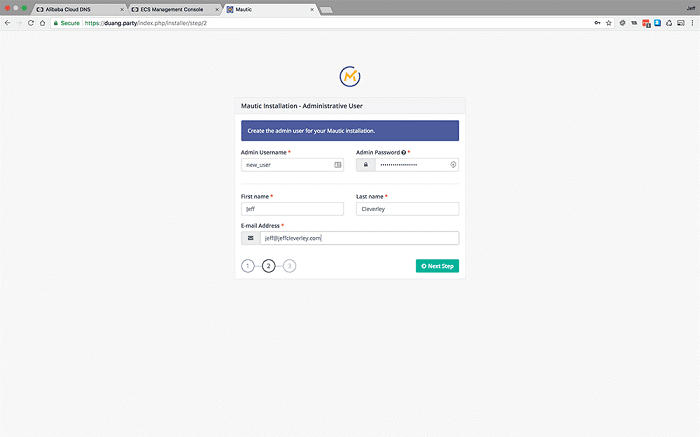 You will be asked to provide an email address and a cron job will be created to automatically renew your certificate every week. 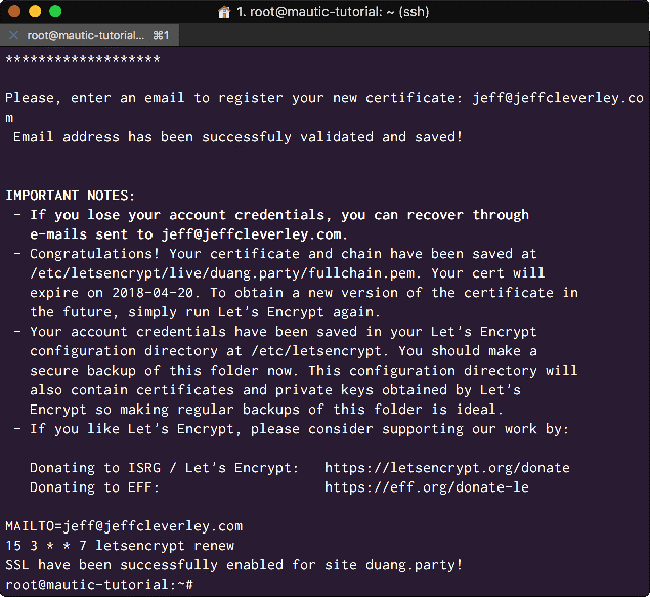 Since Webinoly uses Certbot by Let's Encrypt, your Nginx Virtual Host Configuration file will be automatically updated to serve your site using HTTPS (port 443). 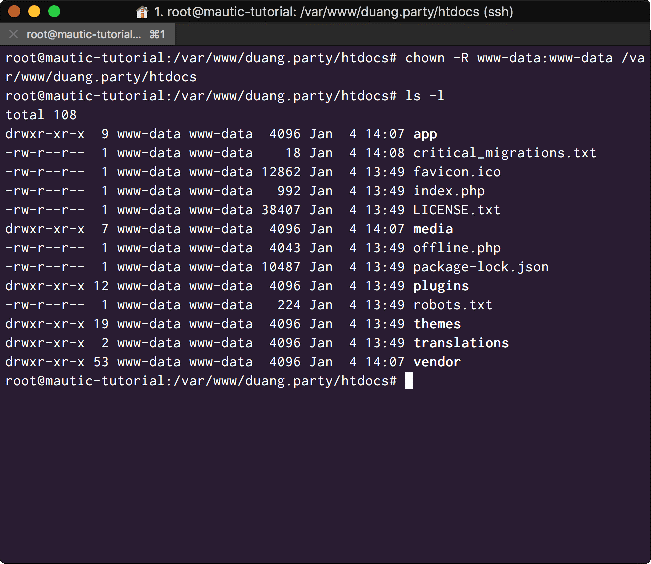 We need to make the web server user and group 'www-data' the owner of all of these files and directories. 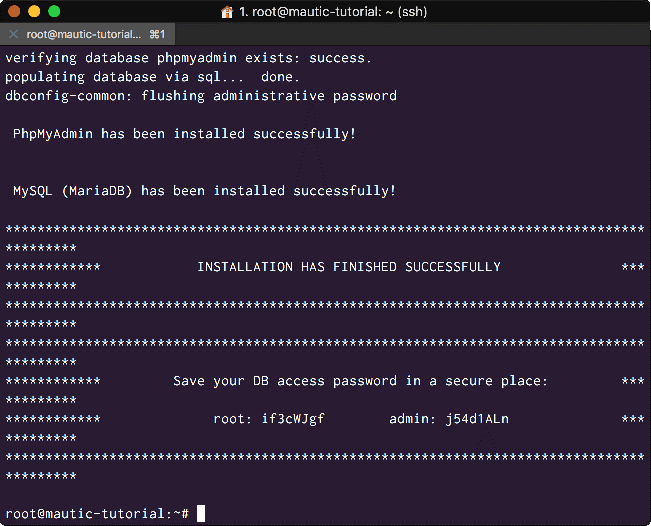 The final step in the Mautic installer set up is the email configuration. These settings can be changed later from within Mautic, but we can set them up now. Choose your sender and sender email. 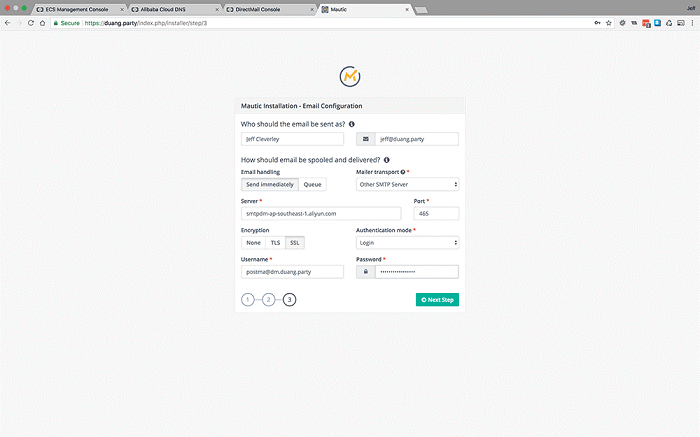 Choose how you want Emails handled, immediately or queued. In Server, enter the Alibaba Cloud Direct Mail server you will be using. You can get that server address here. Choose Port 465 and SSL Encryption and Login Authentication mode. 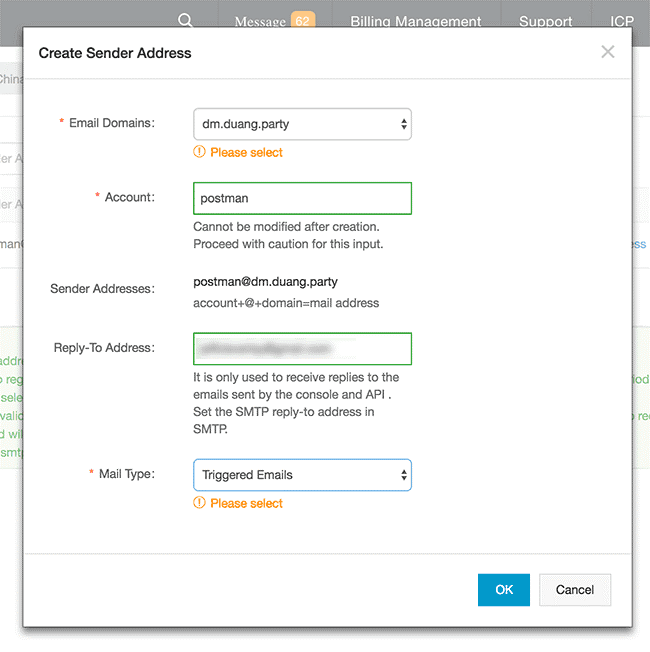 Enter the SMTP username and Password you created in Step 3 above. 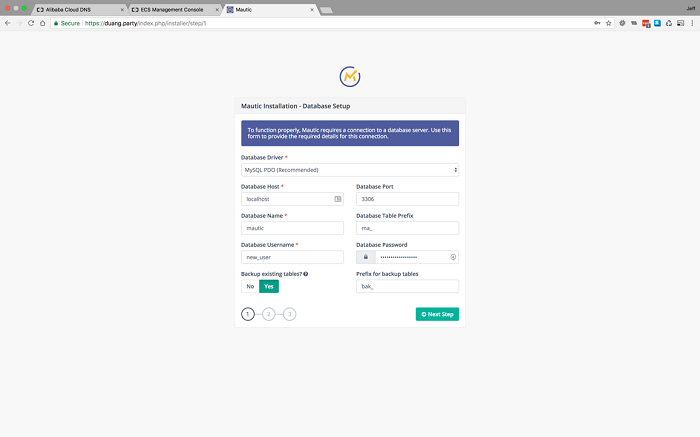 Mautic will take you to its dashboard and we are ready to start automating our marketing! If you want to check that Direct Mail is working. Click on the Settings Icon in the top right, then on Email settings. There is a Green 'Test Connection' button, click this. If everything is working perfectly you will get a success message. That's it! Mautic is an impressive platform that is constantly growing. Find out more here. 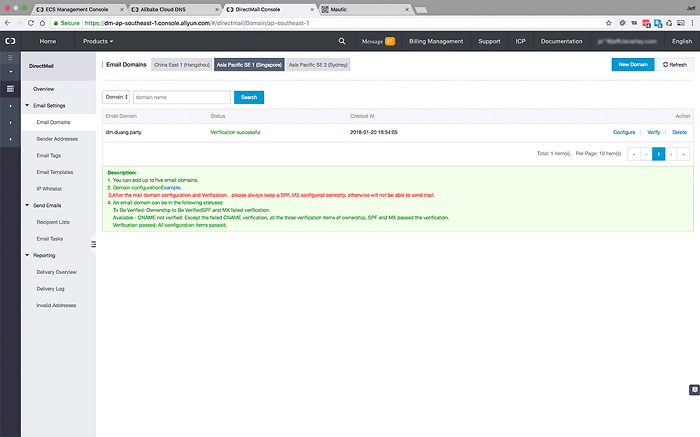 How to Install Puppet Master and Client on Ubuntu 16.04.